The Supermicro AOC-SHG3-4M2P M.2 NVMe SSD carrier AOC features four internal sockets for 4 different lengths of M.2 SSD coupled with an on-board switch allowing dense storage with intense performance. Designed for flexibility, this AOC fits a standard PCI-E 3.0 x8 slot and will require minimal, if any, BIOS or OS modifications to work instantly. 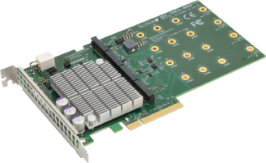 This robust add-on card will address the growing demand for increased storage performance and scalability for a diverse range of solutions; from entry-level SMB systems to enterprise class server platforms. Ideal for embedded/IPC solutions and desktop/gaming station solutions, NVMe SSDs outperform current SAS/SATA SSDs several times over. Form factor: PCI-E 3.0 x8 full-height (FH).